First of all, I apologize for my absence from ezine writing. 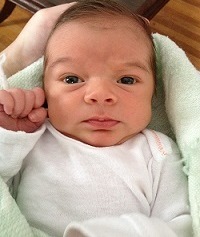 My husband and I welcomed a beautiful baby boy on February 20th. As you parents know, life with a newborn is a wonderful little whirl-wind. But the hiatus is over! As I look at him I wonder about so many things. Will he be a thinker? A doer? An adventure seeker? A leader? A follower? Will he like music? Or art? How about soccer? Or basketball? And if he is anything like me, will he like running? This leads me to wonder, If, When, and How we can encourage our children to love running. We aren't talking about running and playing out in the yard. It is completely natural and healthy for kids to do this. No, we are talking about actually running a couple miles, maybe a couple races, maybe even a marathon. Should they participate in these types of structured runs? 1. Let them come to you about running. Many children develop a love of running through watching their parents dedication to the sport. Don't force your love of running on them. This may turn them off to the idea and they may miss out on all the great benefits and therapeutic effects of the sport if they feel like they have to run because you want them to. Which leads us to Tip #2. 2. If it's not fun and enjoyable for them don't push it. There are so many interests and hobbies out there that they are sure to figure out what fills them up if they are encouraged to find out what that is. I think a lot of parents would love for their child to be like them and enjoy running since they know the happiness that it brings themselves. But these little independents of ours are just that: independent and different in their own ways. 3.	is great for kids to have goals just make sure they are attainable. This is something that needs to be monitored as a child that sets unreasonable running goals for their age is only setting himself up for disaster. Why should we subject them to their naivety? Don't get me wrong they need goals but keep them age appropriate. It might be just finishing a 5K instead of finishing a 5K under 25 minutes. You know your child best so help them attain what they are capable of. 4. If your child experiences an injury that is a sure sign that they are doing too much, too soon. Make them ease back and rest. When children are growing they don't need anything to interfere with their growth patterns. And since I brought up that hot topic, as far as health and growth is concerned, research has suggested that there isn't much to be worried about in children that are running a couple miles. In fact, weight bearing exercises like running is good for their bones. However running a marathon isn't probably the best idea. A good idea is to stick with 10 miles or less. Of course this 10 miles or less rule depends on the age and maturity of the child. A good guide to follow is that starting at age 5 a child can run half their age in miles. Therefore a motivated (I stress motivated) 10 year old can probably handle a 5 mile run. Just make sure they build up to it. I wouldn’t want to push for much more than that though. On another note, parents of teenage girls should make sure that they know the issues with packing on too many miles and the effects it can have on the female menstrual cycle. It is also a good idea to insist that your daughter take a calcium vitamin. See more about this issue here. 5. Let them go running with you! You can develop such an incredible bond doing so. This time alone together is absolutely invaluable! Never underestimate what you can teach them just by the example that you give them. This is also a good time to emphasize some of the ins and outs of being runners such as proper nutrition and hydration, cool downs, rest days and the like. A love of running comes from knowing the sport and a passionate teacher. As a runner you know the wonderful effects of running just through experience. Now imagine sharing this with your son or daughter! So I'm sure you have heard about Meb Keflezighi's Boston win! So exciting having an American take the Boston cake after 31 years! Read more about it here . Rita Jeptoo made her own Boston marathon news by taking the female win for the 3rd time! She also set a course record in a time of 2:18:57. See details here . A marathon runner got an unlikely opportunity to take part in the North Korean Marathon. His fascinating story can be read here . The Walt Disney Marathon registration opened yesterday at noon! If you are are planning on running sign up soon!